Metropolitan Cathedral of San Giorgio dei Greci, in Venice. The Greek Orthodox Cathedral of Saint George in Venice, known as San Giorgio dei Greci ((Greek) Άγιος Γεώργιος των Ελλήνων) is the oldest and historically the most important church of the Orthodox Diaspora. For centuries it has been one of the most splendid Orthodox temples in the world. Despite the close ties of Venice to the Byzantine world, the Greek Orthodox Rite was not permitted in Venice for centuries. 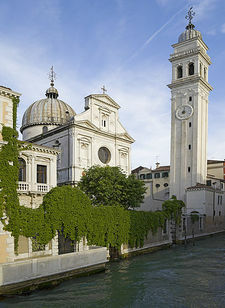 Finally in 1539, after protracted negotiations, the Papacy allowed the construction of the church of San Giorgio, financed by a tax on all ships from the Orthodox world. The church was completed in 1573 and became the center of the Scuola dei Greci, the Confraternity of the Greeks in Venice. Since 1991 the church of Saint George has served as the Metropolitan Cathedral of the new Archdiocese of Italy and Exarchate of Southern Europe. The Cathedral of Saint George was built with the contributions of the Greek Orthodox faithful residing in and travelling through Venice. The building permit for construction was issued only after repeated attempts and hard struggle. In obtaining the permit, two classes of Greeks immigrants played a key role: the Greek soldiers serving in the Venetian army and the Greek intellectuals. The building phase began in the year 1539 and was completed in 1573 at a total cost of 15,000 gold ducats. The architects of the church were the famous Sante Lombardo (1539-1547), Gianantonio Chiona (as of 1548 onward) and Bernardo Ongarin (1587-1603), who also designed the inclined bell tower. Architecturally, the Cathedral is a domed Basilica with a single inflection. From outside it resembles a Venetian Church of the Renaissance Era. As a whole the Cathedral is simple and imposing, decorated with beautiful and harmonic architectural elements. so that they may worship God according to their ancestral tradition". Upon entering the Cathedral the visitor faces an imposing interior. Soon after the completion of the church in 1573, an invitation was extended to Michael Damaskinos, the greatest Cretan iconographer of the day, who painted almost the whole iconostasis, as well as many other sacred images (1574-1582). Another well-known iconographer from Crete, Emmanuel Tzanes-Bounialis, also a Priest at the Church, completed the iconostasis by painting the two Sanctuary Doors and the two iconostasis columns. John the Cypriot (1589-1593), a great iconographer of his time, later painted the walls of the dome, under the supervision of the famous Venetian painter Tintoretto. The most important work in the Cathedral is the inspiring Byzantine Icon of the Blessing Christ (early 14th century) which is placed to the left of the Royal Gate. This Icon was donated by Princess Anna Paleologina-Notaras,[note 1] daughter of the last Grand Logothete of the Eastern Roman Empire. This famous Icon is mentioned in the writings of Goethe and André Malraux. Also of exceptional beauty, are the mosaics executed by known Post-Byzantine artists. The mosaic of the Deisis in the apse of the Sanctuary was performed after drawings of Thomas Bathas from Corfu (1598) who was an important traditional iconographer of his time. Equally valuable are the paintings in the Sanctuary, as well as the other icons and items of liturgical worship kept in the Cathedral (16-18th century). Hundreds of beautiful Icons, vestments and sacred items were transferred to the nearby Hellenic Institute in the beginning of the 1950's. A large number of these treasures are displayed today in the Museum of Byzantine Icons next to the Church. A significant number of items are still kept in the storehouse of the Institute awaiting restoration. The Flanginian school (left) and San Giorgio dei Greci (center). The Cathedral of St.George had the exceptional privilege to be directly subject to the Ecumenical Patriarchate of Constantinople from which it received its eminent Clergy. The Cathedral of Saint George, a treasured jewel of the Greek Orthodox Diaspora, has been for centuries the ethnic and religious center of Hellenism in the city and broader region of Venice which at its peak numbered 15,000 members. Gradually a whole Greek neighborhood took shape around the Church. The Flaginean College which sat next to the church, was for centuries (1662-1905) an ecclesiastical academy providing many regions of the Orthodox East under Ottoman rule with educated priests and teachers. The same building now hosts (since 1953) the Hellenic Institute of Byzantine and Post-Byzantine Studies. Also, the oldest building of the Campo dei Greci hosted for centuries the Monastery of the Noble Greek Nuns in Venice (1601-1834) and its attendant Greek Girls' School. All these institutions, together with the famous Greek publishing houses in the neighborhood and the Cathedral of Saint George, formed a center of flourishing Greek Orthodox presence and activity in the Venetian lagoon. Important personalities of the Greek Nation served as priests at the Cathedral of Saint George. Next to the church, between 1573 and 1797, were the headquarters of the Metropolitans of Philadelphia. Such eminent hierarchs as Gabriel Seviros, Gerasimos Vlachos, Athanasios Valerianos and Methodios Moronis all sat on the Metropolitan Throne of Philadelphia. Under the shadow of the Church of Saint George worked, among others, St. Nicodemus the Hagiorite to publish the Philokalia, one of the most famous pieces of Orthodox spiritual writing. Also, Vartholomeos Koutloumousianos from Imvros, a professor at the Flaginean College, worked here to publish the Menaia. The abolition of the Republic of Venice in 1797 by Napoleon initiated the decline of the wealthy Greek Orthodox Community. The assets and valuables, as well as the precious golden items of the church, were confiscated by the Napoleonic authorities. Many Greek Orthodox then started to emigrate to more secure regions. Nevertheless, this did not result in the total disappearence of the Greek Orthodox element of the city. Despite the difficulties affecting the church community of Saint George, the church continued its existence and activity, preserving a significant part of its wealth, as well as its historical and artistical treasures to this very day. In November of 1991, the Ecumenical Patriarchate of Constantinople founded the Holy Archdiocese of Italy and Exarchate of Southern Europe, designating as its location the historic Campo dei Greci in Venice. The church of Saint George was elevated to the Metropolitan Cathedral of the new Archdiocese. The Cathedral of Saint George has since become an emblem not only for the Orthodox faithful in Venice, but for all Orthodox in Italy. Archdiocese of Italy and Malta. Church of Saints Peter and Paul of the Greeks (Naples, Italy). Together with two of her sisters, she had already been send to Italy when the Ottomans conquered Constantinople in 1454. Her father, Byzantine Grand Duke and Prime Minister, Loukas Notaras, and the rest of the family were killed. She became a leading member of the Byzantine Diaspora and 1471 she obtained the permission of the city authorities to establish a Greek colony in the Commune of Siena, but for an unknown reason it never materialized. Later moved to Venetia where she worked for the right to establish an Orthodox Church against the wishes of the Roman Catholic hierarchy. She used her mother's surname Palaiologina and (d. 1507). (Women in Power 1450-1500). Arcidiocesi Ortodossa Di Italia E Malta. The Greek Orthodox Cathedral of San Giorgio dei Greci, A Brief Historical Note. Retrieved: 2012-09-08. Manno, Antonio. The Treasures of Venice. The Rizzoli Art Guides. ed. New York: Rizzoli International Publications, 2004. pp.256–257. Hellenic Institute of Byzantine and Post-Byzantine studies in Venice. This page was last edited on October 21, 2012, at 21:15. This page has been accessed 12,610 times.